Near the corner of Hobart and Forest Streets, across from the Danvers Witchcraft Victims’ Memorial, is the site of the first meetinghouse of Salem Village. Ministers who preached here were James Bayley (1672-79); George Burroughs (1680-83); Deodat Lawson (1684-88); Samuel Parris (1689-1697); and Joseph Green (1698-1701). 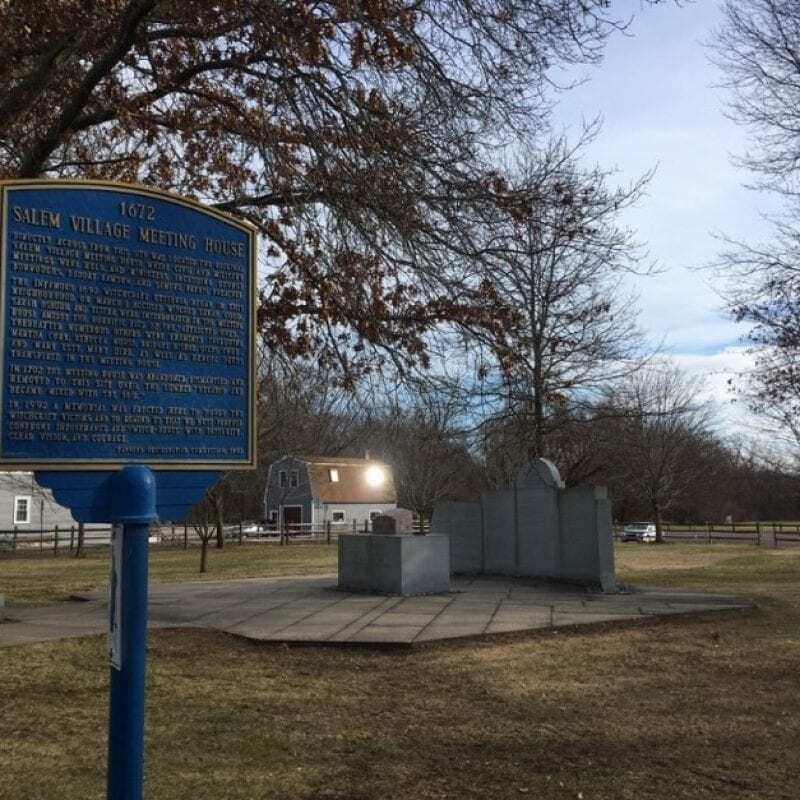 Salem Village’s first meetinghouse was built in 1672 on an acre of land given by Joseph Hutchinson. In his 1867 work Salem Witchcraft, Charles Upham described the structure as, “’Thirty-four feet in length, twenty-eight feet broad, and sixteen feet between joints.’ Two end galleries were added, and a ‘canopy’ placed over the pulpit.” The church in Salem Town had recently built a new meetinghouse of their own. They donated their old pulpit and deacons’ seats to be installed in the Salem Village meetinghouse. The first Salem Village meetinghouse was the scene of numerous examinations of accused witches. The first three to be accused, Tituba, Sarah Osborne (alternate spellings Osborn, Osbourne, Osburn), and Sarah Good were examined here on March 1. The initial examinations were originally scheduled to take place at Ingersoll’s ordinary down the road, but so many people turned up to witness the initial examinations they had to relocate the proceedings to the larger meetinghouse. Also examined here were Rebecca Nurse, Dorothy Good, Martha and Giles Corey, Bridget Bishop, and Mary Easty (alternate spelling Esty). Key sermons given here include: the first from Reverend Samuel Parris on November 19, 1689, in which he instructed his congregation on how he should be treated: “You are to endeavor by all lawful means to make my heavy work, as much as in you lies, light and cheerful . . . And not by unchristian-like behavior to myself, or one another, or other Churches of God . . . ;” Reverend Deodat Lawson’s guest sermon of March 20, abruptly interrupted by Abigail Williams; and the sermon given a week later in which Reverend Parris scolded Mary Sibley publicly for suggesting the use of counter-magic to root out the witches. The first meetinghouse fell into disrepair less than 30 years after it was built. 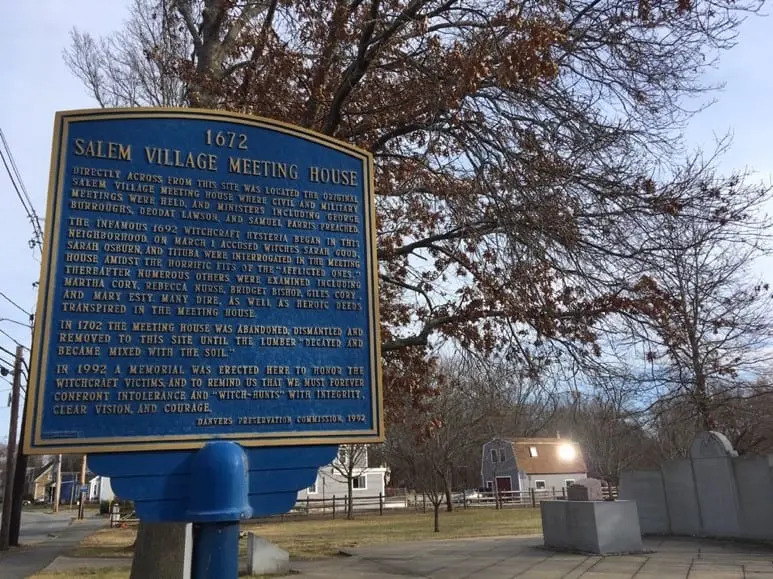 That, combined with the need for a bigger space, not to mention its unhappy past, led the people of Salem Village to abandon it in 1701 and erect a new meetinghouse down the road, on the corner of Hobart and Centre Streets. Additional note: Three Sovereigns for Sarah, starring Vanessa Redgrave as Sarah Cloyce, was filmed in 1984 and aired in 1985 as a miniseries for PBS’s American Playhouse. 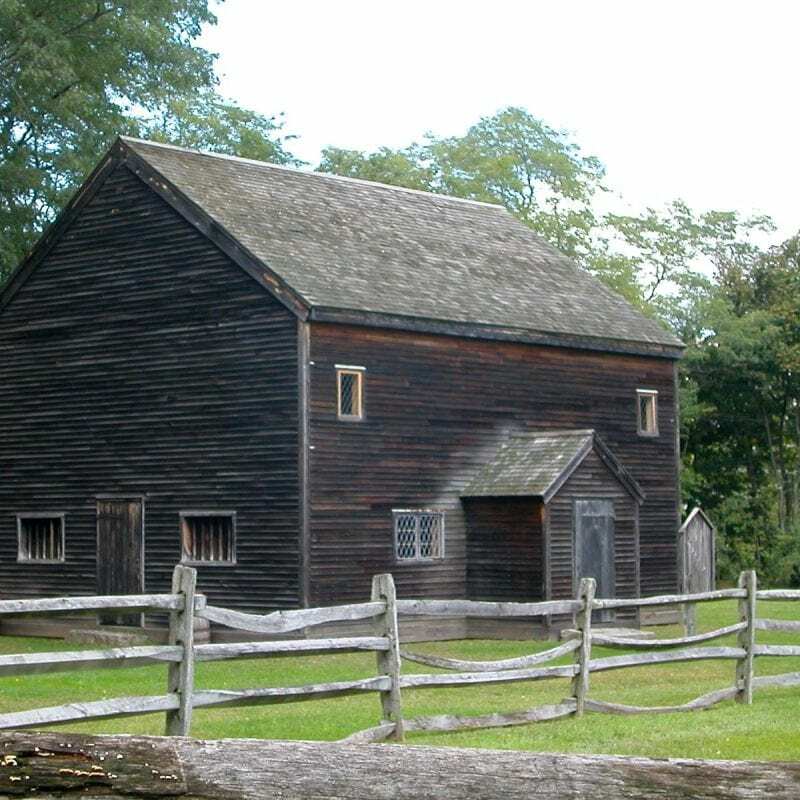 At that time, a replica of the first meetinghouse was constructed on the property of the Rebecca Nurse Homestead for use in the movie. 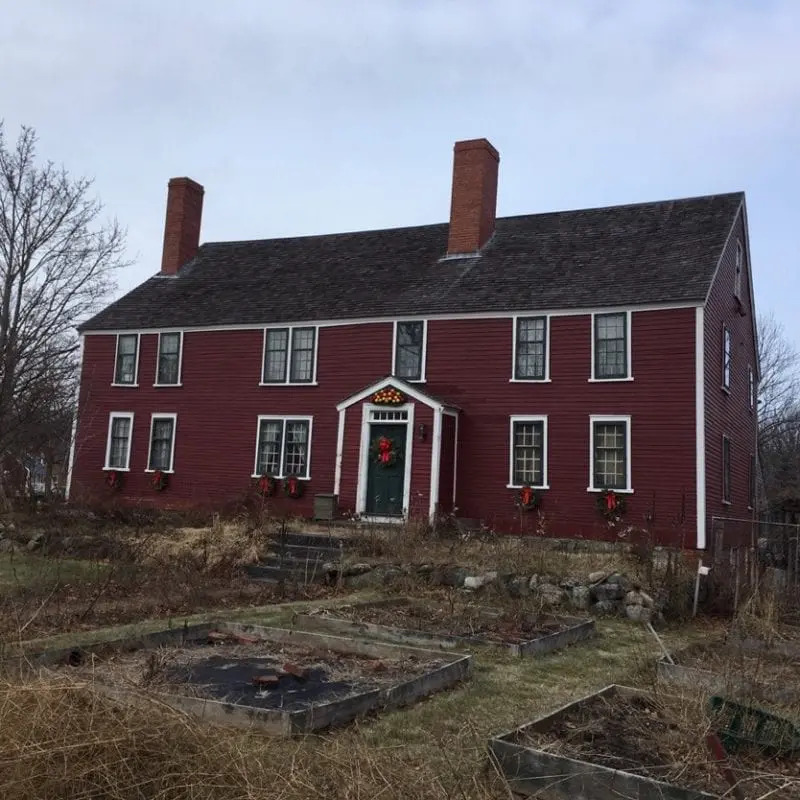 Today, visitors to the Rebecca Nurse Homestead can tour the building. Additional note: The house standing on the corner of Hobart and Forest Streets (next to the site of the first meetinghouse) is known as the Darling-Prince house, which was moved here from Newbury Street in the 1840s. It dates to circa 1681 and is actually two houses put together. Replica of the first meetinghouse at the Rebecca Nurse Homestead, photographed in 2008. The site of the first meetinghouse is across from the Witchcraft Victims’ Memorial. The house that stands on the corner of Hobart and Forest Streets (next to the site of the first meetinghouse) was built circa 1681 and was moved to this property in the 19th century. It is known as the Darling-Prince House and is the combination of two houses.